Sudden Cardiac Arrest & the Chain of Survival: Sudden cardiac arrest (SCA) is a condition in .. There is nothing like the HeartSine Samaritan 500P public access defibrillator with CPR advisor.. 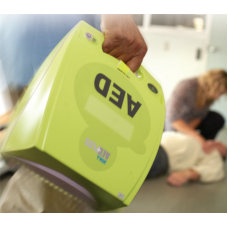 The Zoll AED Plus Defibrillator is the latest European Technology.Easy to use, with complete step by..
Heartsine Samaritan Pad Defibrillator Trainer Fully simulated AED with complete voice training .. BREAK IN CASE of EMERGENCY !!!! Heartsine Samaritan Defibrillator White Powder Coated W.. Adult & Paediatric Pad Set If you use the AED and download the data for our collection then..